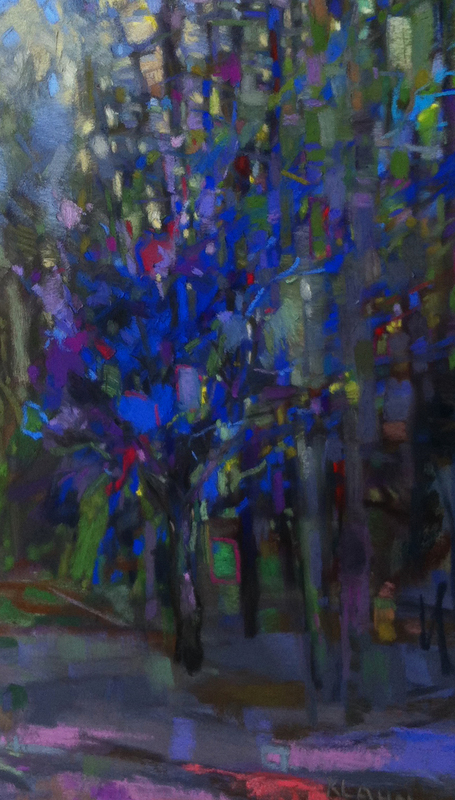 I worked at resolving several large works today, and started a small landscape. Could this piece be any more strangely titled? This represents about a quarter of the sheet, but the photo isn't good, so I'll let you see this detail of it. It's a beautiful detail. Jewel-like. I look forward to seeing the whole painting. This piece has a mosaic feel to it and I thought Christmas lights. Thank you for looking and commenting, Linda. I envy the way pastelists see color. I have always had a difficult time using color. Suggestions? Vivian - thanks for commenting. I hope that my next series of workshops will be on color. I'm writing the program for that now. Maybe I will also teach it online. Please stay tuned. One hint: use a different green for the foreground and the background. They have to push forward or backward, and uniform colors in each ground (fore - mid- back)are flat.